Stumbled into Attackpoint for the first time in a while. I haven't used it for a little while but great to see still a flourishing little community of NZ orienteers using it, and great to see some evidence theres some people training out there!! 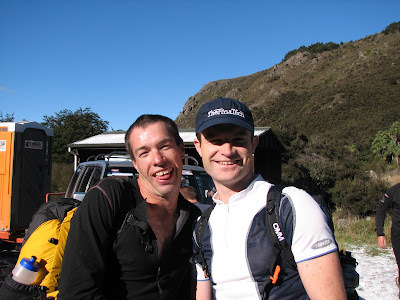 I picked the following off Greig Hamiltons log, reporting his and Tim Sikma's 3rd place finish in the NZ Rogaining Champs. The National Rogaine Champs. We ended up doing okay, possibly due to the lack of real competition. We got 2160pts but I think 2500+ would be do-able if a bit fitter. I didn't feel great for the first 7hrs, I was drinking Leppin Enduro which I have used before but I think I should have had some water too as the Enduro wasn't quenching my thirst and I started to get a headache. I think the heat or my sun hat might have also been causing problems. When the sun went down and I got some plain water I started to feel better. Navigated well until about 9.5hrs into it where I made an incredibly big mistake and lost 30mins, made a parallel error on a leg but I should have been concentrating and checking things more carefully. We ended up having a 40min sleep on the course, not sure it cost us much time because we were pretty fast for the next few controls and my navigation was really good apart from a 10min mistake when I got a bit lazy and sidled too low into some scrub. Made another 15min mistake going into a control at about 9am. We were jogging into the control and I didn't slow down enough and just headed into the control circle then couldn't find it straight away. It was just over a ridge in another gully. Should have taken a better bearing and used an attack point that hadn't been chopped down. Overall a good event, I looked after my feet well and got no blisters, got a bit of chaffing between the legs but it wasn't too bad. Ate well, cheese and hummus rolls, fruit biscuits, leppins, gu, museli bars, pikelets. Navigation was pretty good apart from the three mistakes, all the other controls we went straight to the control without losing any time at all. Things to improve: More running and hill work. Need to carry a pack that is quite heavy, training with 2L water, food, gear, torch, plus some extra to simulate carrying partner's gear. I wasn't used to this and felt a bit slow. Can probably get away with a smaller battery, only used 1.2Amp/hr worth of battery. Maybe make some smaller ones and test them out.